Poland Not in the Pale. A portion of Russia in which Jews are allowed to reside. Unlike other Russian subjects, the Jewish inhabitants do not generally possess the natural right of every citizen to live unrestrictedly in any place in the empire. Furthermore, they are permitted to leave the Pale of Settlement—that is, to move to another place for permanent or for temporary residence—only under certain conditions defined by law. The Pale was first established in 1791, when the White-Russian Jews, who had passed under Russian rule (1772) at the first partition of Poland, were forbidden to join merchant or artisan gilds in governments other than those of White Russia. As a favor to the Jews, Catherine II. extended at the same time their right of citizenship to the viceregency of Yekaterinoslav and the territory of Taurida. Since that time this regulation has been constantly in force, though the limits of the Pale have been modified from time to time. The fundamental official motive for this limitation is ostensibly the protection of the less enlightened Russian people against the economic enslavement that might be imposed upon them by the Jews. But the exceptions made by the government were directly calculated to develop the economic activity of the Jewish population; hence it may be assumed that by the establishment of the Pale it was really intended to remove the religious influence of the Jews over the Russians. Accordingly, the Pale included, besides the Polish governments, the South-Russian governments, where the Greek-Orthodox element did not form a considerable portion of the mixed population. With the successive partitions of Poland the Pale was enlarged by the addition of governments wherein Jews lived in great numbers. In 1794 it included those of Minsk, Izyaslav, Bratzlav, Polotzk, Moghilef, Kiev, Chernigov, Novgorod-Syeversk, and Yekaterinoslav, and the territory of Taurida. To these were soon added the Lithuanian governments of Wilna and Grodno; and in 1799 the Pale was further augmented by the addition of Courland. In 1804 Jews were given access to the governments of Astrakhan and Caucasia; but at the end of the reign of Alexander I. and in the reign of Nicholas I. the extent of the Pale was diminished. Thus in 1835 the governments of Astrakhan and Caucasia were no longer included. At the same time the Jews were forbidden to reside in certain places within the Pale itself, e.g., in the military ports of Sebastopol and Nikolaief (Nikolayev), and in Kiev; in the villages of the governments of Moghilef (Mohilev) and Vitebsk; and on crown lands and in the Cossack villages of the governments of Chernigov and Poltava. Aside from this, the Jews were forbidden to settle anew in the fifty-verst boundary zone. About this time also Jews were expelled from the villages and hamlets of certain governments. Jews have lived and still continue to live in the governments of Warsaw, Kalisz, Kielce (Kyelstzk), Lomza (Lomzha), Lublin, Piotrkow. Plock, Radom, Suwalki, and Siedlec (Syedletz); but these are not included in the Pale. Formerly they were considered almost as a separate world. Until 1862 the Jews of these governments were forbidden to reside in the Pale; and, on the other hand, the Jews of the Pale had not the right to reside in any of these (Polish) governments. At present (1904) the Pale includes, according to law, fifteen governments: Bessarabia, Wilna, Vitebsk, Volhynia, Grodno, Yekaterinoslav, Kovno, Minsk, Moghilef, Podolia, Poltava, Taurida, Kherson, Chernigov, and Kiev. Moreover, Jews registered in the merchant gilds may reside in Sebastopol (since 1861), in Nikolaief (since 1866), and in Kiev (since 1861). The right of temporary residence in the last-cited place is granted also to young men studying in schools or in workshops, as well as to their parents. Two districts only, Plock (Plossk) and Lybed, are assigned for residence to the Jews; and Jews may live in other parts of the city only by special permission of the local authorities. Under Alexander III. the city of Taganrog, the district of Rostov, and the city of Yalta (1893) were excluded from the Pale, which was still further narrowed during his reign by the so-called "Temporary Regulations" (1882), which have now remained in force for more than twenty years. By the provisions of the new law Jews were forbidden to settle anew outside of towns and townlets; and only those Jews were allowed to remain in the villages who had already lived there for many years. Yet the general conditions of the times led to the expulsion also of those who had the legal right toreside in villages. The senate was overwhelmed with complaints, and repeatedly declared that certain expulsions were illegal, explaining, for instance, that the removal of a Jew from one house to another in the same village could not be considered sufficient cause for his expulsion from the village itself; and that a Jew who had left a village for a term of service in the army did not thereby lose the right at the conclusion of such service to return to his old residence. The local authorities, however, continued and still continue to expel the outlawed Jews. In the reign of Alexander III. the Jews were energetically removed from the fifty-verst boundary zone, where they had again settled during the milder reign of Alexander II. Recently the law prohibiting Jews from living in the boundary zone was abolished; and the Pale was correspondingly augmented. There are places outside the Pale where Jews who comply with certain requirements are permitted to reside. 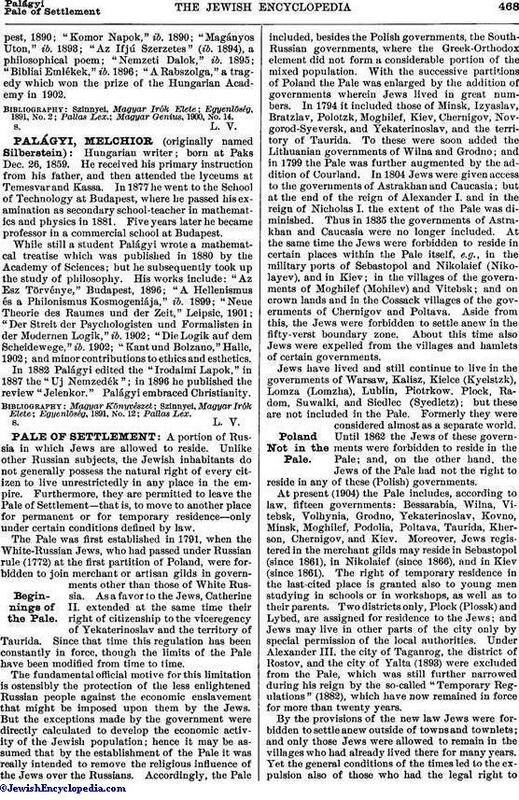 In Courland, as also in the townlet of Shlok in the government of Livonia, the right of permanent residence is granted only to those Jews (and their descendants) who were registered there in the census of 1835; but the settlement of Jews from other governments is prohibited. Jews who were living in the Caucasus at the time of its conquest by Russia are known as "mountain" Jews; and their descendants enjoy the rights accorded to the other mountaineers. In the second decade of the nineteenth century attempts were made to expel the Jewish inhabitants of the Caucasus; but as many of them occupied entire villages, were engaged in agriculture, and were in some places owned as serfs by the landlords, it was decided in 1837 not to disturb the Caucasian Jews. Other Jews, however, were forbidden to establish themselves in the Caucasus. Subsequently, from 1852 to 1869, at the instance of the viceroy of the Caucasus, 460 Jewish families were allowed to register in the local communities. Outside the Caucasus the mountain Jews are permitted to live only in the Pale and in the Polish governments mentioned above. In Turkestan the right of residence is granted to those Jews only whose forefathers have lived there from time immemorial. In Siberia Jewish farmers were assigned certain districts in 1835, in the governments of Tobolsk and Omsk; but in 1837 not only was the further settlement of such farmers prohibited, but provision was made for diminishing the number of those already settled there. Only criminals and their sons of eighteen years of age or upward were allowed to remain in the districts in question. In the reign of Alexander II. the right of Jews to register in Siberian communities was revoked. Only those Jews who had been sent to Siberia for some crime, and their children, were excepted. 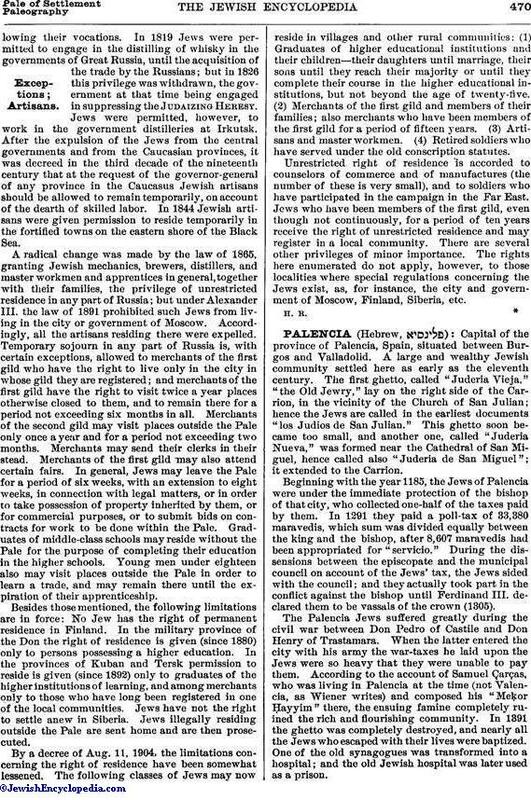 (1) Merchants of the first gild: The law of 1859 permits Jews who have been registered for a period of five years as merchants of such gild within the Pale to register also in the gilds of any place outside the Pale, and to establish themselves in such places with their families and a certain number of servants. But when a merchant who has been a member of the gild for less than ten years ceases to be a member of it, he must, even when possessing real property, move back to the Pale within two years. Only continuous membership in the first gild for a period of ten years secures to the merchant the right to remain without the Pale after leaving the gild. A special exception is made in the city of Moscow. A Jew may become a member of the Moscow merchant gild only by permission of the minister of finance and the governor-general of Moscow; and the right of residence in Moscow is withdrawn on resignation from the gild. 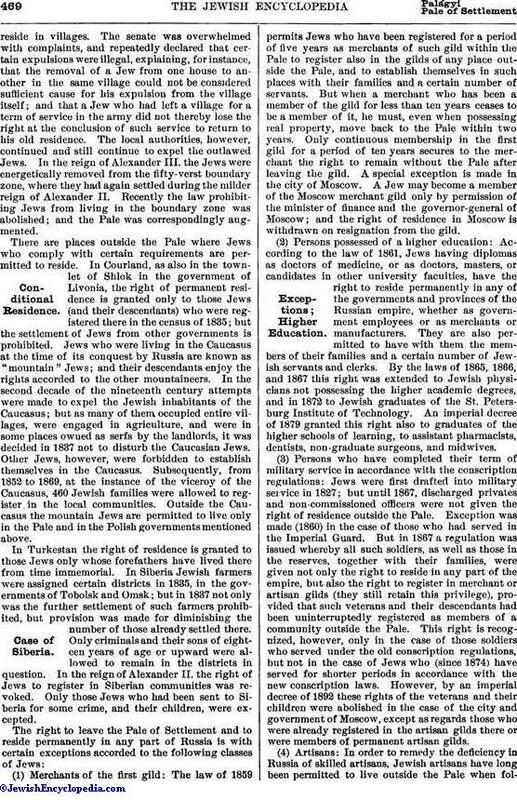 (2) Persons possessed of a higher education: According to the law of 1861, Jews having diplomas as doctors of medicine, or as doctors, masters, or candidates in other university faculties, have the right to reside permanently in any of the governments and provinces of the Russian empire, whether as government employees or as merchants or manufacturers. They are also permitted to have with them the members of their families and a certain number of Jewish servants and clerks. By the laws of 1865, 1866, and 1867 this right was extended to Jewish physicians not possessing the higher academic degrees, and in 1872 to Jewish graduates of the St. Petersburg Institute of Technology. An imperial decree of 1879 granted this right also to graduates of the higher schools of learning, to assistant pharmacists, dentists, non-graduate surgeons, and midwives. (3) Persons who have completed their term of military service in accordance with the conscription regulations: Jews were first drafted into military service in 1827; but until 1867, discharged privates and non-commissioned officers were not given the right of residence outside the Pale. Exception was made (1860) in the case of those who had served in the Imperial Guard. But in 1867 a regulation was issued whereby all such soldiers, as well as those in the reserves, together with their families, were given not only the right to reside in any part of the empire, but also the right to register in merchant or artisan gilds (they still retain this privilege), provided that such veterans and their descendants had been uninterruptedly registered as members of a community outside the Pale. This right is recognized, however, only in the case of those soldiers who served under the old conscription regulations, but not in the case of Jews who (since 1874) have served for shorter periods in accordance with the new conscription laws. However, by an imperial decree of 1892 these rights of the veterans and their children were abolished in the case of the city and government of Moscow, except as regards those who were already registered in the artisan gilds there or were members of permanent artisan gilds. (4) Artisans: In order to remedy the deficiency in Russia of skilled artisans, Jewish artisans have long been permitted to live outside the Pale when followingtheir vocations. In 1819 Jews were permitted to engage in the distilling of whisky in the governments of Great Russia, until the acquisition of the trade by the Russians; but in 1826 this privilege was withdrawn, the government at that time being engaged in suppressing the Judaizing Heresy. Jews were permitted, however, to work in the government distilleries at Irkutsk. After the expulsion of the Jews from the central governments and from the Caucasian provinces, it was decreed in the third decade of the nineteenth century that at the request of the governor-general of any province in the Caucasus Jewish artisans should be allowed to remain temporarily, on account of the dearth of skilled labor. In 1844 Jewish artisans were given permission to reside temporarily in the fortified towns on the eastern shore of the Black Sea. A radical change was made by the law of 1865, granting Jewish mechanics, brewers, distillers, and master workmen and apprentices in general, together with their families, the privilege of unrestricted residence in any part of Russia; but under Alexander III. the law of 1891 prohibited such Jews from living in the city or government of Moscow. Accordingly, all the artisans residing there were expelled. Temporary sojourn in any part of Russia is, with certain exceptions, allowed to merchants of the first gild who have the right to live only in the city in whose gild they are registered; and merchants of the first gild have the right to visit twice a year places otherwise closed to them, and to remain there for a period not exceeding six months in all. Merchants of the second gild may visit places outside the Pale only once a year and for a period not exceeding two months. Merchants may send their clerks in their stead. Merchants of the first gild may also attend certain fairs. In general, Jews may leave the Pale for a period of six weeks, with an extension to eight weeks, in connection with legal matters, or in order to take possession of property inherited by them, or for commercial purposes, or to submit bids on contracts for work to be done within the Pale. Graduates of middle-class schools may reside without the Pale for the purpose of completing their education in the higher schools. Young men under eighteen also may visit places outside the Pale in order to learn a trade, and may remain there until the expiration of their apprenticeship. Besides those mentioned, the following limitations are in force: No Jew has the right of permanent residence in Finland. In the military province of the Don the right of residence is given (since 1880) only to persons possessing a higher education. In the provinces of Kuban and Tersk permission to reside is given (since 1892) only to graduates of the higher institutions of learning, and among merchants only to those who have long been registered in one of the local communities. Jews have not the right to settle anew in Siberia. Jews illegally residing outside the Pale are sent home and are then prosecuted. By a decree of Aug. 11, 1904, the limitations concerning the right of residence have been somewhat lessened. The following classes of Jews may now reside in villages and other rural communities: (1) Graduates of higher educational institutions and their children—their daughters until marriage, their sons until they reach their majority or until they complete their course in the higher educational institutions, but not beyond the age of twenty-five. (2) Merchants of the first gild and members of their families; also merchants who have been members of the first gild for a period of fifteen years. (3) Artisans and master workmen. (4) Retired soldiers who have served under the old conscription statutes. Unrestricted right of residence is accorded to counselors of commerce and of manufactures (the number of these is very small), and to soldiers who have participated in the campaign in the Far East. Jews who have been members of the first gild, even though not continuously, for a period of ten years receive the right of unrestricted residence and may register in a local community. There are several other privileges of minor importance. The rights here enumerated do not apply, however, to those localities where special regulations concerning the Jews exist, as, for instance, the city and government of Moscow, Finland, Siberia, etc.